Due to the BRDC deciding to resurface and/or carry out maintenance work to the Silverstone track, the MG Live weekend event has very unfortunately been cancelled. However, Kevin Kivlochan has kindly stepped into the breach and offered to share their Historic Road Sports grid at the HSCC Silverstone meeting on the 19th May, again on the GP circuit. An amendment to our 2019 calendar has been made below. Hunt Bags Tom Cole Trophy Again! In a close fought battle involving two former Tom Cole Trophy winners, Martin Hunt in the HWM emerged victorious after Chris Keen in the Kurtis 500S handicapped himself with a jumped start and a slow pit stop. This grid was one we shared with the VSCC 50s sports car race for the Hawthorn International Trophy, won comfortably by Philip Walker’s Lotus 15 after Andrew Smith retired his Cooper Monaco. The grid however was predominantly that of FISCAR compliant cars with the usual small number of invitation cars that we always bring to this race and our numbers were gratifyingly up on last year’s grid. Despite some concerns the mix of grids worked out pretty well given the performance variation between the quickest VSCC cars and the slowest FISCAR cars with a high standard of considerate driving throughout which included some excellent dicing down the field. 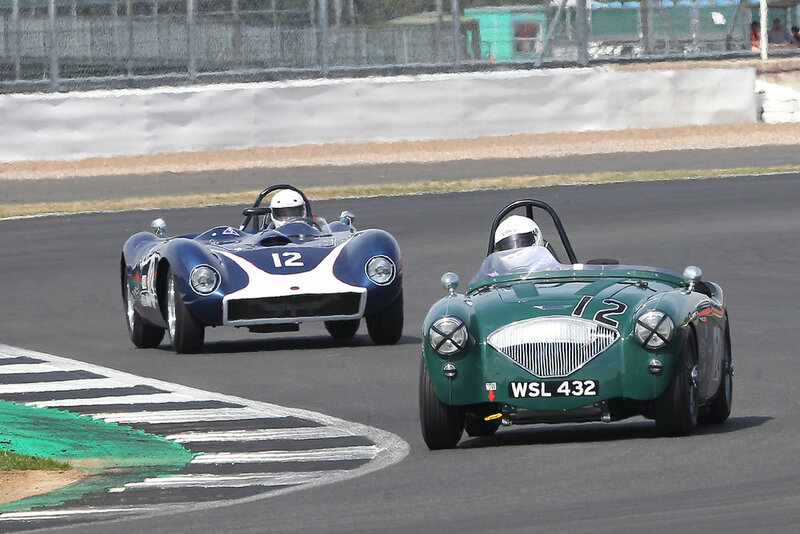 ‘We would like to invite your members to take part in The Pomeroy Trophy, taking place on Saturday 16th February 2019 on the Grand Prix Circuit at Silverstone. 2019 will see the 64th running of this historic event, which is totally unique. The format of the event is driving tests on the circuit in the morning, followed by 40 minute track sessions in the afternoon in which we ask competitors to achieve a target number of laps. This year our grid will be joining the VSCC’s own 1950 Sports Car race. However, our cars, which will be the usual mix of FISCAR compliant and Invitation cars, will again be racing for the Tom Cole Trophy, whilst those VSCC cars which do not fit into our regs will be competing for the VSCC’s Hawthorn Memorial Trophy. This should be an exciting grid. Entry for this is already open. We will be sharing the grid with the Historic Road Sports cars and as it is on the GP circuit there is plenty of room and an opportunity to really stretch the legs of your car. Please note that the entry fee reflects the fact that this is a 40 minute race (with pit stop) with 30 minutes of qualifying, so plenty of track time..
We join the slower cars within HSCC’s Historic RoadSports classes on the fabulous and popular Brands GP circuit. Our annual pilgrimage to the West Country to savour the Castle Combe circuit at this increasingly popular event in front of thousands of spectators. The pack charges through Quarry as a great start sees Martyn Corfield in his Frazer Nash Le Mans Replica lead and heading down Farm Straight and under the marshal’s board towards the Esses for the first time. Marc Gordon (Jaguar XK 150) and Robin Ellis (Lotus Elite) give chase. Martyn Corfield drove superbly well to take our Inter-Marque race on Sunday. A brilliant start from the 3rd row of the grid set up the victory although he was caught and passed by an absolutely on form Robin Ellis in his Lotus Elite. The Elite looked on course for victory when Richard Fores took over the car only to have to retire it. Martyn had to keep the pace up though, as excellent drives from Stephen Bond (Lister Bristol) and Marc Gordon (Jaguar XK150), saw them both well clear of the pack and finish within 7.2 seconds of the Frazer Nash after 30 minutes of racing in very tricky conditions. There was great racing all the way down the field, on a day in which FISCAR excelled itself in giving the wet and cold spectators, both quality and quantity. A full report will follow. It should also be recorded that The AC Ace team, which has returned in numbers this year won the Annual Inter-Marque team Trophy, and I was particularly delighted to see Justin Becket win the Whitehead Cup. Justin described this as beginners luck but you don’t win this unless you turn up and be competitive on a regular basis and Justin did both, so very well earned. Justin Becket in his AC Ace, winner of the Whitehead Cup and part of the winning Inter-Marque Team. Despite the addition of a few post 1960 sports cars, Brian Arculus dominated the Inter-Marque race at Snetterton last Saturday, winning at a canter. Splendid drives by Paul Griffin in the Connaught ALSR and Jim Campbell in his Austin Healey 100/4 netted them 2nd & 3rd overall. We were also delighted to welcome 3 newcomers to FISCARs ranks - Philip Elder in his MGA, Ewen Sergison in Paul Lovett’s Connaught L2 & Harry Naerger in his Jowett Jupiter - and we hope to see them all again. It was a rare sight to see (repeated later in the Archie Scott Brown race) 2 sports racing Connaughts on the same grid, and particularly appropriate this year on the 70th anniversary of the first Connaught to be produced. Jim Campbell took his beautifully prepared Austin Healey 100/4 to victory at Silverstone. Initially giving best to veteran racer, John Harper, in David Brazell's Jaguar C type, Jim maintained a consistency of pace which saw him shake off the challenge of the Kellison J4R and assumed the lead once the C type had pitted for its driver change. John had displayed all the skills that made him a highly successful historic racer more years ago than I care to say, but it was unreasonable to expect David to quite match his pace after the changeover but he still brought the C type home in a fine 2nd place with the Kellison of Tyzack/Hiscocks, 3rd. Paul Griffin who also took the class 4 win, was an excellent 4th overall in his Connaught ALSR, and followed home by Class 3 winner Alan House in his Morgan Plus 4 whilst 6th overall was taken by Justin Beckett in his AC Ace Bristol, thus making it 6 different marques in the top 6 places. In a small but very classy field of Feltham Aston Martins, Chris Woodgate won the Jon Gross Memorial Trophy in Jon's 1958 ex Sebring DB MkIII, in front of the Gross family who still own this fabulous car. It was an entirely appropriate and emotional outcome in memory of Jon who had campaigned this car so enthusiastically for so many years up until the day before he died. Chris, was followed home by Tony Green in the famous ex works DB 2, VMF 65 and Peter Dubsky was 3rd overall in his 15/98 and was therefore also winner of the Mort Goodall Cup for prewar Astons. Edward Bradley won the 1500cc class in his splendid Ulster. In a grid augmented, through necessity, by VSCC's own 1950s Sports cars group and some additional members of Richard Culverhouse's new club, the CMMC, Brian Arculus drove well to finish top of the FISCAR class. It was, though, yet another day that we have to rue a shortage of numbers. This was compounded by the non appearance of two of our entries, although it was noted that at least two of those cars entered under the VSCC banner were also FISCAR compliant. I thank those members who came out to play on this historic, interesting and challenging circuit. Full report to follow in due course. An unusually small grid for the Tom Cole Trophy nevertheless was of high quality and featured a superbly close fought race between the Martin Hunt/Patrick Blakeney- Edwards in Martin's HWM Jaguar and Richard Wilson in his beautiful Maserati 250S. Martin made a superb start and defended skilfully for several laps before finally giving best to the slightly quicker pole sitting Maserati. However, he kept close to the Italian car so that when he pitted to hand over to Patrick Blakeney-Edwards the slightly slower stop by the Maserati was telling, and Patrick emerged in the lead which he just held to the end despite the engine running rough in the latter stages. Less than 3 tenths separated them at the flag with Richard taking fastest race lap. There were some great dices further back, not least between Richard Woolmer in Matthew Collings HWM Cadillac, Stephen Bond in his Lister Bristol Flatiron and Martyn Corfield in his Frazer Nash Le Mans Replica. The always spectacular Woolmer prevailed in the HWM to take 3rd but was just 2 seconds ahead of the Lister after 30 minutes of racing. Another close encounter was that of the well driven AC Ace Bristol of Tim Pearce and Lotus Elite of Brian Arculus, with Brian pipping Tim by less than half a second. They finished 6th and 7th respectively. The team of 3 splendid AC Aces, driven by Tim, David Cottingham/Adrian King, and Justin Beckett won the team award. Full race report, results and photos have been started under 'Special Races' in the header menu - JT (also see photo below). Our annual successful season opener where we continue to run a special race in memory of Tom Cole. The format is the usual 30 minute race with compulsory 45 second pit stop to enable those who wish to avail themselves of the two driver option. Eligible cars are all FISCAR compliant with traditionally a few additional invited sports racing cars to spice it up. Please note that the VSCC will also be running their 1950s sports car race on the same day so FISCAR members have the opportunity of a second race if they wish. A new event for us. We have, for some reason, not provided good grids at this famous circuit so let's support the VSCC who have kindly invited us to join them. The VSCC paddock and ambience may better suit our members. The format is the usual 30 minute race with compulsory 45 second pit stop to enable those who wish avail themselves of the two driver option. Eligible cars - restricted to our usual FISCAR compliant cars. This very popular meeting with The Bentley Drivers Club has a lovely old fashioned club feel to it which suits FISCAR perfectly but whilst our grids have been just about adequate over the last couple of years, they could have been so much better. We should be able to muster well over 30 cars for this lovely meeting, so let's show BDC how much we appreciate their invitation and continued faith in our ability to provide an interesting and high quality field. The format is the usual 30 minute race with compulsory 45 second pit stop to enable those who wish to avail themselves of the two driver option. Eligible cars - restricted to our usual FISCAR compliant cars. 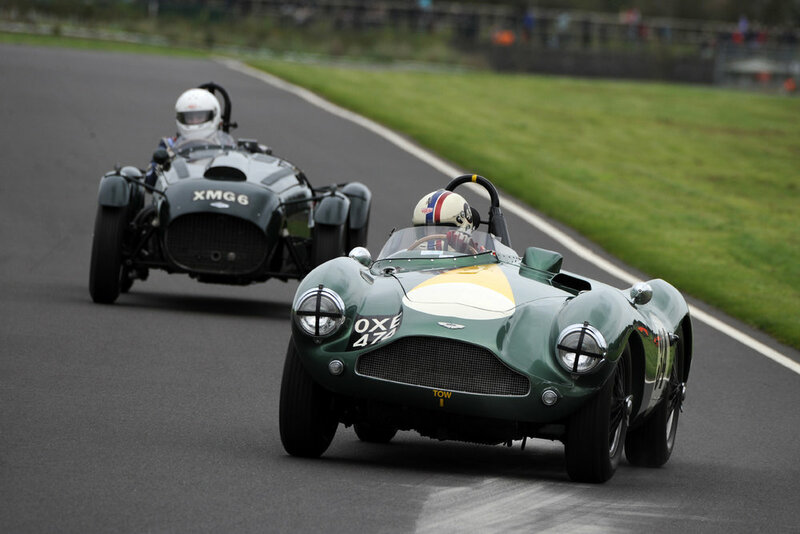 This lovely race for all pre 1960 Aston Martins has been moved to the BDC meeting from Castle Combe. There are classes for the sports racers (DB3/3S), GT cars (DB2, DB2/4 & DB MkIII), prewar 2 litres (15/98 etc) and 1500cc (Ulster etc). It is not yet clear whether your Chairman will also be able to run the Bic Healey Cup. Details will be posted here when known. This is the 4th running of this race but is particularly poignant and significant this year as it will be the 60th anniversary of the tragic death of this legendary driver at Spa in 1958, so I'm really hoping that this year we can present a grid that does justice to Archie. The race is a 30 minute non stop race for all pre 1960 sports racing cars running on Dunlop L section tyres or the Blockley equivalent AND ALL FISCAR compliant cars. There will be plenty of classes and flexible depending on the entries received. Our consistently successful season finale. The format is the usual 30 minute race with compulsory 45 second pit stop to enable those who wish to avail themselves of the two driver option. Eligible cars - restricted to our usual FISCAR compliant cars. Steve Boultbee-Brooks and his Aston Martin DB3S proved once again to be invincible in our two races at Castle Combe retaining the Jon Gross Memorial Trophy chased gamely home by Martyn Corfield in his invitation Frazer Nash Le Mans Replica and then taking victory in the FISCAR Inter-Marque race for the third time in succession. In the latter he was subjected to some interesting tactical racing by a pair of the Lotus Elites, and Robin Ellis in Tony Mantle's example finished second just over 3 seconds behind after 30 minutes of racing. In the Jon Gross Memorial Trophy, the GT class winner was, very appropriately, Chris Woodgate, driving Jon's Ex Sebring Aston Martin DB MkIII which is still retained by the Gross family. Here Chris is seen ahead of the Aston Martin Brooklands driven by Mark Gillies who again won the Mort Goodall Cup for prewar Astons. In a small grid further depleted by retirements, Brian Arculus, after a very brief early challenge from Nigel Winchester's special bodied AC Ace, cruised his Lotus Elite to victory ahead of Kevin Kivlochan's AC Ace Bristol and Jim Campbell's Austin Healey 100/4. After a poor start from pole, Jonathan Abecassis in his familiar Austin Healey 100/4, later handing over to Richard Woolmer, took victory in our Inter-Marque round last Saturday. They were chased home by long time leader, Stephen Bond, in the splendid Lister 'Flatiron' Bristol, with Robin Ellis, last year's winner, taking 3rd place in Tony Mantle's Lotus Elite after a terrific recovery drive from 16th at the end of lap 2. The race was also marked by a dramatic accident in Luffield when a set of wheel studs on Paul Ziller's Triumph TR2 snapped and launched the car into a roll, finishing on its roof in the gravel. Fortunately, Paul emerged under his own steam from the car and after a check up at the medical centre was given a clean bill of health which was decidedly more than could be said of the TR. Remarkably, however Paul has entered the car for our Donington race on 2nd September! Later in the day Jonathan completed the double by comfortably winning the Chairman's Bic Healey Trophy race. Once again a superb grid of FISCAR cars lined up at VSCCs Spring Start meeting, our first race of the 2017 season, and once again the cars starred. The race was very eventful and we had at least three different leaders and there was much dicing through the field. The best of these was that of erstwhile race leader, James Cottingham recovering from a spin in the Ferrari 500TRC, and poleman, Guillermo Fierro Eleta, first time out in his gorgeous Maserati 300S who made a poor start and got swamped. The battle which at the time was for 2nd, was only broken up by the compulsory pitstop, taken by James but missed out altogether by Guillermo with inevitable consequences! Whilst all this was going on, Chris Keen was maintaining a few seconds lead in the Kurtis and eventually ran out the winner but only after Cottingham who had emerged ahead of him in the pitstops, retired the Ferrari 5 laps from the end with overheating. Steve Boultbee-Brooks took the fantastic sounding Aston Martin DB3S to a fine second and Jonathan Abecassis emerged from an epic 3 way Austin Healey battle to take 3rd overall. Mark Hoble, resting his TR2, took the Index of Performance win in his Turner Mk1. The Lotus Elite Team (Lotus Legends) won the team award, and were chased home by the two Austin Healey teams, The Healey Hares and The Healey Hounds. Full report now ready - See 'Special Races' in the menu. In a race of attrition, Mark Hoble rose to 9th place overall in his Turner, capturing victory in the Index of Performance category. FISCAR has organised an exciting 6 race series for the coming season. All races will be run over 30 minutes and include a compulsory pit stop, in order to allow a second driver to participate. There are no shared grids. We again join the Morgan Sports Car Club, this time, on a rare visit for us, to the Brands Indy Circuit. Let's break the mould for both MSCC and the Brands circuit by providing them with a top class grid. After an absence of a year, we return to this lovely circuit, to run the Blaster Bates Trophy for only the second time. The current holder of the Trophy, Mike Freeman, in his Lotus Elite, had a superb dice with Jonathan Abecassis in his Austin Healey 100/4 in 2015, but the grid was numerically low, so we need to do much better this time. The Bentley Drivers Club has revamped this meeting to reinforce the wonderful old club style feel that has always existed at this event, and FISCAR has increased it's commitment and input. As well as our usual Inter-Marque race, we are running the King George VI Cup for invited pre 52 sports cars - *See separate box below for more details*. In addition to the above, your Chairman is again running, on his own account, the Bic Healey Trophy which includes the AC v Austin Healey team challenge. All FISCAR compliant Austin Healeys and ACs are eligible and they will be joined by Special bodied Sprites and appropriate Invitation cars. Once again our season finale where we have consistently provided our best grid of the season. We will again also be running the Jon Gross Memorial Trophy, primarily for Pre 1960 Feltham Aston Martins and the Mort Goodall Cup for prewar Aston Martins. FISCAR, in conjunction with the Bentley Drivers Club, are adding a new format race for 2017. The event will be for Sports and GT cars produced in the 1938 – 1951 era, but will include certain models that were introduced before that date if production continued into that period, such as Aston Martin 15/98 and BMW 328. The race will be titled the “George VI Cup”. The 20 minute race will be run on the Silverstone National circuit on August 5th 2017. It will be open, by invitation only, to models with competition provenance that were built in the era. Cars must run to the specifications that they ran and looked as they did in period. As a guide, cars that ran at Le Mans in the 1938 – 1951 period and in the early postwar Spa 24 hour races are particularly the models that are most eligible. Typical eligible cars will include original specification Jaguar XK 120, V12 Lagonda, Fraser Nash LMR, Healey Silverstone, Connaught L2, Jowett Jupiter, HRG 1500, Talbot T26, Aston Martin Speed Model and DB2, Riley Sprite and many more. David Cottingham and Jim Campbell shared the Whitehead Cup, in this, the first year it has been awarded. This was a closely fought contest and you needed to have scored well in at least 4 of the 5 qualifying events. Ultimately, Jim, who gave Castle Combe a miss, was caught on the line by David who attended the final meeting. They both finished with 33 points. Hard on their tails were the pair of Triumph TR2s of Mark Hoble and Paul Ziller, on 32 & 31 points respectively, both having competed at all 5 events. 5th was Nick Matthews in his Austin Healey 100/4 with 29 points. The Inter-Marque Trophy was won by the Healey Hound team and by a clear margin. However, 2nd place was shared by the Lotus Legends and AC Aces. It is true to say that these 3 marques have formed the backbone of our grids over recent seasons, although if the above mentioned Mark and Paul could persuade another TR out and the MG boys could regularly field a 3 car team, they would both be in with a good shout at the trophy. Steve Boultbee-Brooks drove a blinder in the rain on Saturday to hold off a determined group of Jags and Healeys in the highlight race of the day. A full grid of Inter-Marque cars streamed around in the rain and most managed to stay on the track despite the very slippery conditions. The Healeys however, drove well enough to secure the overall Team of the year award and receive the Silver trophy for the year. David Cottingham drove another good solid race in his AC Ace and became joint FISCAR "Driver of the year" ( shared with Jim Campbell) receiving the "Whitehead Cup" as a reward for a seasons committed effort. Steve continued his winning ways, later in the day, and again in wet conditions by heading the Jon Gross Memorial Trophy race from start to finish, chased home very gamely by Nick Ruddell who won the GT class, in his Aston Martin DB2/4. Third overall and winner of the Mort Goodall Cup was Mark Gillies, in the Aston Monoposto, repeating his victory from last year. A really fine grid of FISCAR Inter-Marque cars, sprinkled lightly with a few Chairmans sports racers entertained us at BDC's splendid meeting at Silverstone last Saturday. Proving once again that the Elite is FISCAR's benchmark car, Robin Ellis took the honours. Driving Tony Mantle's Lotus Elite, rather than his own, Robin took the lead from the off, but was pressed hard by the Austin Healey 100/4 of Jonathan Abecassis in the first half of the race. Jonathan's pit stop, however, was a little slower than that of the Elite which left Robin to bring the car home to the flag unchallenged in the second half. In the team battle, the MGA team took a fine victory, and our Index of Performance winners were Glenn and Rory Tollett in their MGA. 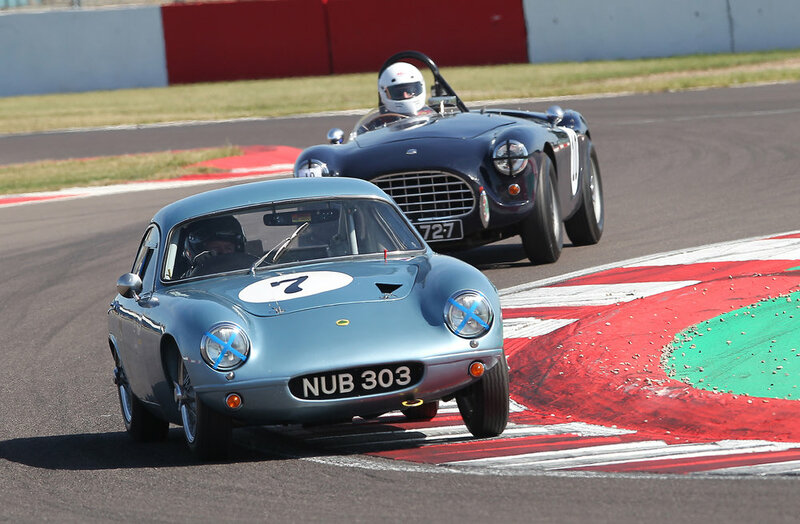 Mike Freeman took his Lotus Elite to outright victory in this big field which combined our Inter-Marque cars and MGCC Iconic 50s cars on the Silverstone GP circuit. He was chased home all the way by the MGAs of Mark Ellis and Neil Cawthorne, from the Iconics series, with Robin Ellis in his Lotus Elite 4th, so nearly caught by a hard charging Brian Arculus, who started from the pitlane, also in his Elite. Full race report and photos now appear under the Race Reports '16 of our menu, above. After Mike Freeman failed to start the race and poleman, Jonathan Abecassis, visited the gravel at Redgate from which he was unable to extract himself, the lead battle boiled down to the Austin Healeys of Nick Matthews and Neil Hardy. Hardy grabbed an early lead but was overtaken by Matthews during the first lap. They then circulated rapidly together until the compulsory pit stop created a gap from which Hardy was never quite able to recover. Jim Campbell had a lonely race to 3rd, also Austin Healey mounted, whilst excellent drives from Brian Arculus and Mark Hoble, in Alfa Romeo Giulietta SVZ and Triumph TR2 netted them 4th and 5th. The Healey Hounds won the team challenge from the Lotus Legends and Brian Arculus won the individual Handicap award. Sadly, after the trials and tribulations of the previous week, Keith Hampson failed to start the race following head gasket failure after qualifying well in the Sunbeam Alpine Le Mans (see below). Car recovered by Police and should soon be returned to Keith, hopefully in time for our race at Donington with the Morgan Sports Car Club on 22nd May. 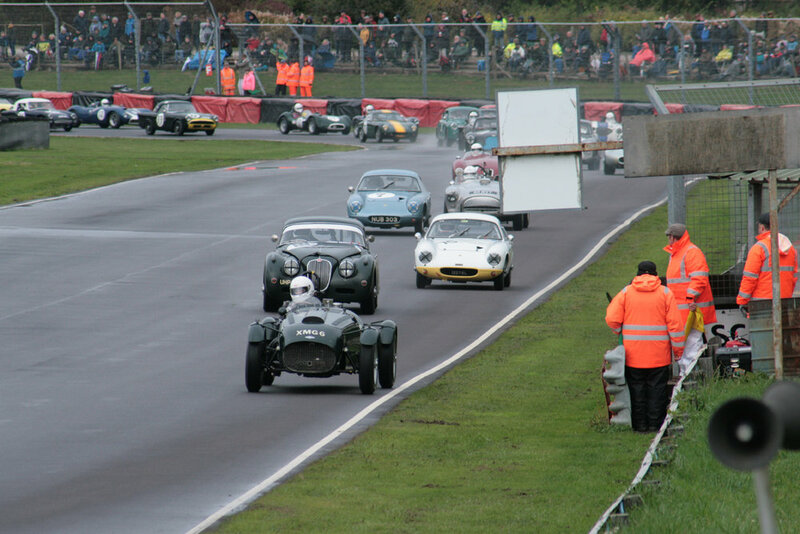 By any standards, The Tom Cole Trophy race provided a superb and interesting grid of fabulous 1950s sports and sports racing cars on a day in which the VSCC delivered spectacle in bucket loads. Darren McWhirter hit the front on lap 2 with the big Lagonda V12 and then controlled the gap to Steve Boultbee-Brooks who once again entertained us hugely in the lovely Aston Martin DB3S to finish 2nd ahead of Chris Keen who had worked through the field from a pitlane start in the Kurtis 500S. Andy Sharp, snatched the lead at the start with his DB2, couldn't contain the sports racers but was again impressive to finish a clear 4th ahead of much close dicing down the field. Star car, in a race full of them, was the Nash Healey Le Mans owned by José M. Fernandez in its first race in the UK for 65 years. The car had finished 3rd at Le Mans in 1952 and Sam Stretton showing due deference to this wonderful piece of history gently stroked it home towards the back of the field, but it had real presence and we can only hope that we get the chance to see it out again. FISCAR are pleased to announce that Richard Culverhouse is joining them for 2016 as Competitions Secretary. He will head up all the race day coordination and racing matters for the members and the race day organisers. He replaces Gillian Carr who has moved on in 2015 to BRDC. Richard comes with a wealth of Motorsport experience and will be very well known to Historic racers worldwide having worked with AMOC, CSCC and many others both sides of the pond. Richard will be at Race Retro26th, 27th and 28th February 2016Hall 2 no E82. He is able to offer discounted tickets to paid up club members if you ask him"ukmotorsport@aol.com". Full Race reports to follow. Earlier in the day, Martyn Corfield had also had one hand on the Bic Healey Trophy, but a puncture induced pit stop deprived him and it was Richard Woolmer, pressing on with great verve in the pretty yellow Sebring to keep Martyn in sight who took advantage and swept to a well deserved victory. The ACs won the Team challenge, a result that was reversed in our later race (above) so honours even! 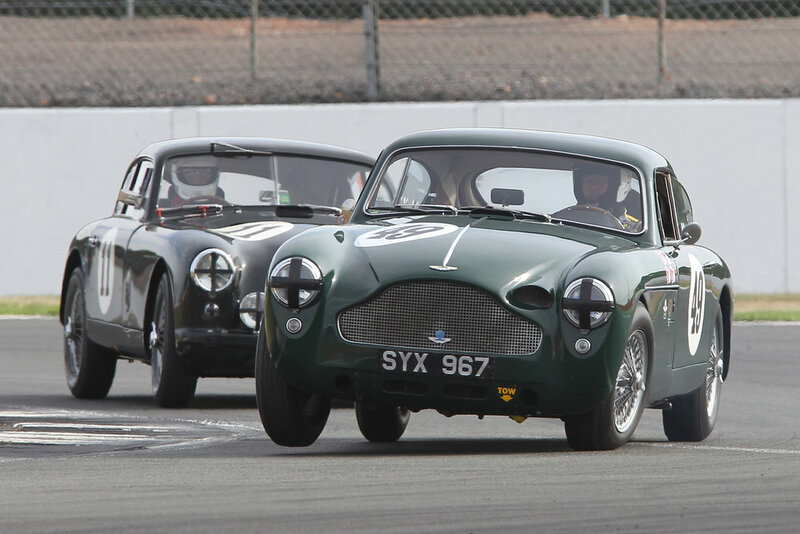 Our cars joined the HSCC HRS grid to make a splendid field at the recent HSCC meeting at Silverstone on 16th May. In a very close 4 team battle where just 2 points separated 1st from last , the Healey Hounds, aided by David Cottingham's lovely AC Ace just edged out the Feltham Flyers team of Aston Martins, with the Jaguars of the Jagged Edge Team, augmented by the very smart MGA Sebring of Glenn & Rory Tollet, sharing 3rd place with the Lotus Legends. Andy Sharp in his Aston Martin DB2 was the leading FISCAR entry home finishing in an excellent 9th overall amongst the later HRS cars but he was chased closely by the Lotus Elites of Mike Freeman and Robin Ellis, both of whom had led the Aston during the course of the race and finished 10th and 11th. * drivers withHistoric cars from the early /mid 50's may apply to enter the VSCC Spring Start meeting in the George Abecassis Trophy Raceemail John Turner at johnturn@btinternet.com to confirm if your car is eligible, but please note that it is a race by invitation only, based on an eligibility criteria intended to create a balanced grid with a particular emphasis on cars of a type driven by George Abecassis in period. In addition to our Inter-Marque race at HSCC Snetterton on June 13/14th listed above, we are to run an Invitation race for sports racing cars in memory of the legendary Archie Scott Brown. The race will also commemorate all the special Builders from the 1950s with a particular emphasis on Brian Lister who sadly died recently. IMPORTANT NOTE - Please note the last race on that list where the FLIERS are to be part of the FISCAR INTER-MARQUE race at HSCC OULTON PARK GOLD CUP meeting, thus making it our first FISCAR ALL COMERS RACE .